Has Georgia Overreached in Ossetia? 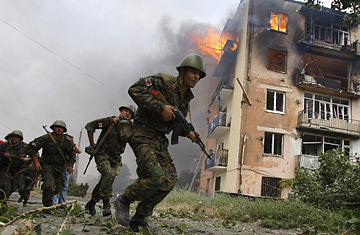 Georgian soldiers run near a blazing building after a Russian bombardment in Gori. The victims, of course, are the civilians of Georgia and its breakaway South Ossetia region, caught in the escalating battle between the Georgian military and South Ossetian separatists and their more powerful Russian backer. Hundreds are alleged to have been killed in two days of heavy fighting that has shown no sign of abating by late Saturday, and thousands more are confronting the resulting humanitarian crisis. But the battle that began to rage in Georgia as world leaders were treated to the pyrotechnics of the Beijing Olympics' opening ceremony may be the most serious challenge to the post-Cold War balance of power since the collapse of the Soviet Union. Georgia and South Ossetia have been squared off in an uneasy peace for more than a decade, now, since the region broke away from Georgia in the early '90s, following its independence from the Soviet Union. After a protracted war that killed around 1,000 people and displaced thousands more ethnic Georgians from the territory, Georgia was compelled to sign a cease-fire agreement that left South Ossetia  a tiny mountainous territory a few football fields smaller than Rhode Island  effectively autonomous, but unable to secure recognition by the international community. Still, Russia has protected the region, providing finance, military protection and even passports, and has used South Ossetia's secession, together with that of Abkhazia, another breakaway region of Georgia, as leverage against Tblisi's desire to join NATO. Moscow sees Georgia's move towards NATO as part of a strategy of hostile encirclement of Russia by Western powers, and when the Western alliance enabled Kosovo's secession from Serbia earlier this year despite the fact that its independence is not recognized by the United Nations, many analysts expected Russia to retaliate by further stoking the fires of secession in Georgia. Georgia's President Mikhail Saakashvili has a different agenda  he won election in 2004 on promise to recover the breakaway territories, and to join NATO. So closely has he courted the U.S. that Georgia today has 2,000 troops in Iraq, the third-largest contingent after the U.S. and Britain, although Tbilisi has now indicated it will have to bring at least half of them home to deal with the security crisis in South Ossetia. But the Georgian leader's latest actions will be read by some as designed to force the hand of NATO members reluctant to press the issue of handing membership to Georgia for fear of provoking a Russian backlash. So, after a couple of days of skirmishing along the unofficial border between his forces and those of the separatists, the Georgian leader launched a full-blown invasion whose aim, his government said, was to "restore constitutional order," that is, control by the central government, in South Ossetia. Plainly, the offensive was a gamble, because Saakashvili should have had little doubt about Moscow's readiness to defend the separatists. Moreover, NATO officials had repeatedly warned the Georgian government against launching any attempt to resolve the dispute through military means. Still, he pressed forward. On Friday, Georgian forces shelled South Ossetian population centers and launched a ground invasion deep into the territory. By noon, news reports announced that they had immobilized much of the opposition and had taken control of South Ossetia's capital, Tskhinvali. The city came under attack by aircraft, artillery and armor, and South Ossetia officials claimed that more than 1,000 people had been killed. Still, the lightning offensive appeared to have put Georgia back in charge of the breakaway region, and made good on Saakashvili's campaign promise. The offensive touched off wild celebrations in the Georgian capital, Tbilisi. "Georgians are by nature extremely patriotic and this event has galvanized them together," David Womble, National director of WorldVision, a Christian humanitarian NGO with operations in the country, told TIME. At one point, he said, thousands and thousands of cars filled the streets of the capital, honking their horns and with their passengers waving Georgian flags. Says Womble, "It was as if Georgia had won the World Cup and was celebrating." Russia's initial response was to convene an emergency session of the U.N. Security Council, hoping to pass a resolution calling for an immediate ceasefire between Georgia and South Ossetia. But the Russian draft resolution was contentious. The United State and others objected to language that appeared to exempt Russia from condemnation over the use of force. Russia is frequently blamed for destabilizing the region to its own benefit and using its peacekeeping force as a cover for maintaining a military presence in the region. The Security Council failed to agree on a resolution, and the following day, as Russian media began to report casualties among Russian troops and citizens in South Ossetia, a stern-faced President Dmitri Medvedev appeared on prime-time television to make a chilling call to arms: "I am obligated to defend the life and honor of Russian citizens, wherever they may be," he said. "We will not let those responsible for the death of our people go unpunished." And with that, Russian armor and artillery began pouring in to South Ossetia, and its aircraft began bombing Georgian positions. By Saturday, there were conflicting reports over which side controlled South Ossetia, but Russian planes had pounded the nearby Georgian town of Gori, in raids that Georgian officials said had killed 60 people. Whether or not the effect was intended, Moscow now appears to be using Saakashvili's strategic overreach to teach a brutal lesson not only to the Georgians, but also to other neighbors seeking to align themselves with the West against Russia. Saakashvili is appealing for Western support, based on international recognition of South Ossetia as sovereign Georgian territory. "A full-scale aggression has been launched against Georgia," he said, calling for Western intervention. But given NATO's previous warnings, its commitments elsewhere and the reluctance of many of its member states to antagonize Russia, it remains unlikely that Georgia will get more than verbal support from its desired Western protectors. Saakashvili appears to have both underestimated the scale of the Russian backlash, and overestimated the extent of support he could count on from the U.S. and its allies. The Georgian leader may have expected Washington to step up to his defense, particularly given his country's centrality to the geopolitics of energy  Georgia is the only alternative to Russia as the route for a pipeline carrying oil westward from Azerbaijan. But Russia is not threatening to overrun Georgia. Moscow claims to be simply using its military to restore the secessionist boundary, which in the process would deal Saakashvili a humiliating defeat.